There are no current emergencies taking place in Highlands County, and we are operating under normal conditions. to our email list to receive live updates on the activation of support programs, urgent business information and more. *One tote per business, while supplies last. 3. Register your business with the state's emergency business database at Floridadisaster.biz. We know you’re busy, but the effects of a disaster on your business will only be worse if you don’t plan in advance. Planning helps you resume operations more quickly, and it gives you a competitive advantage by providing your customers assurance that you’re prepared to serve them even after a disaster. How would you manage your business if access to the workplace is limited by roads closures, streets are impassable, or communication is limited? Visit Floridadisaster.biz for an interactive guide that will generate a custom plan tailored to your business. SBDC specialists can help you develop custom disaster plans. Find out more at 863-784-7378 or floridasbdc.org/business-continuation/. Assemble your essential documents to ensure you have the items needed to quickly submit insurance claims and apply for potential support programs. View a suggested storm kit checklist here (PDF). 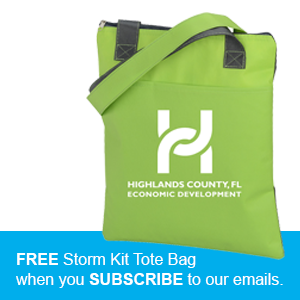 Subscribe to our email list, and we'll send you a FREE storm kit tote and checklist. Complete the online damage assessment, which takes just a few minutes. Your information will be shared with emergency response agencies to expedite implementation of appropriate disaster relief programs. The Small Business Adminsitrations offers low interest disaster loans for individuals, businesses and non-profit organizations. The loans can be used for loss and damages not fully covered by insurance. View this list of information needed for the SBA loan process. The purpose of the Emergency Bridge Loan Program is to provide a source of expedient cash flow to Florida small businesses impacted by a disaster. These short-term, interest-free working capital loans are intended to "bridge the gap" between the time a major catastrophe hits and when a business has secured longer term recovery resources, such as sufficient profits from a revived business, receipt of payments on insurance claims or federal disaster assistance. The Florida Department of Economic Opportunity (DEO) provides the Disaster Unemployment Assistance (DUA) Program to assist businesses and residents whose employment or self-employment was lost or interrupted as a result of a disaster. Full details are available at www.FloridaJobs.org. If you need assistance with the Disaster Unemployment Assistance program, please contact our local CareerSource Heartland at 863-385-3672 extension 301.